BICEP-2, large B-MODES as Big Bang Black Hole Fractal Inlation effect. WHY are the BICEP2 -B-Modes so HUGE? Because the B-modes represent the END of a splitting Fractal Black Hole Big Bang nucleus (singularity) inflation process and Black holes heve electric potential!!! creating Alven and Birkeland currents. So, the Big bang was the splitting and evaporation of the big crunch black hole ( all universal 10^90 particles closely packed inside) into what I call a black hole splitting fractal inflation creating the Lyman Alpha forest structure. What we observe in the B-Modes of the BICEP 2 image should be the END of the Fractal splitting black hole inflation process at the rim of our own Universal bubble and as part of the super symmetric navel cord multiverse. The cyclic universe is a continuous balancing game between dark energy in the vacuum Higgs field and dark matter inside black hole nuclei. 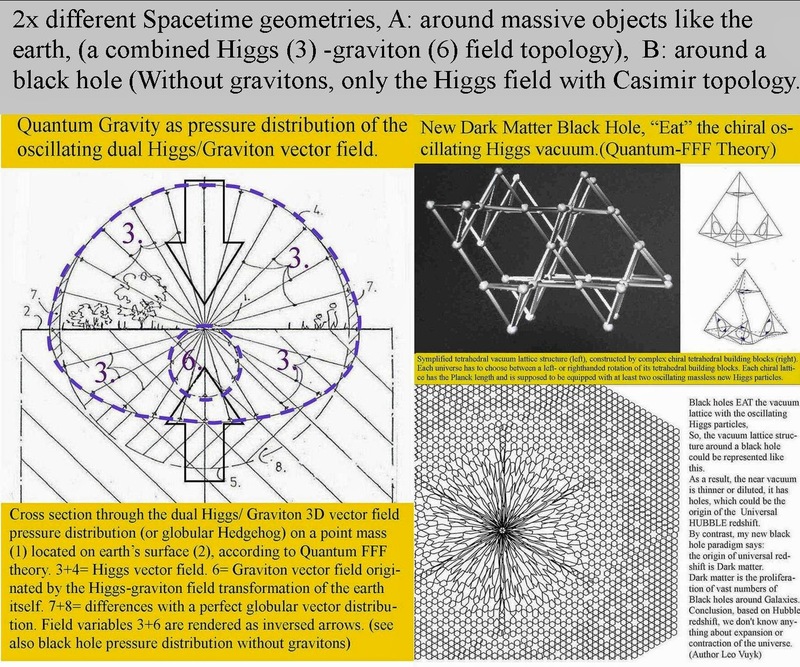 Dark energy is the energetic oscillating Higgs field, dark matter is the particle based (Higgs-Preon) nuclei of all Black holes, with pair production by fluctuations at the BH horizon into positrons and electrons. Electrons at the outside horizon creating an electric potential and magnetic effects visible inside these B-MODES in the CMB. Conclusion: B-MODES arte not in the first place gravitational signals, but magnetic polarization created by splitting and pairing Fractal inflation black holes as the base for fast galaxy/ star formation ( Dual Galaxy Anchor Black Holes) in the early universe.